CONGRATULATIONS to Erika Meyer who won my Book Blast Prize package! It will be coming your way soon, Erika. It is finally the official Launch Day for CELEBRITY STATUS, and we are blasting, blogging and giving away goodies. 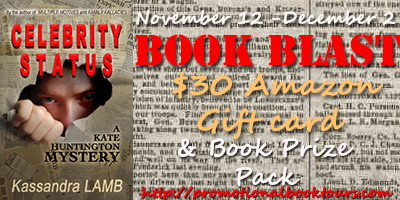 FIRST, Promotional Book Tours is doing a Book Blast for me, sponsoring my book on 50 blogs over the next two weeks and running a contest (see details below on how to win goodies; every person who enters gets a free e-book copy of Multiple Motives). SECOND, in honor of the book’s launch, I’ve posted a somewhat tongue-in-cheek post over on the misterio press site on The History of Emotions. Hop over there and check it out! Kate is now married to Skip Canfield, the man who patiently courted her through the last two books in this mystery series, and life is good. Skip’s private investigating agency, Canfield and Hernandez, may be doing a little too well, however. 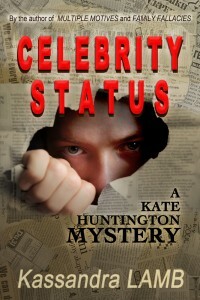 They have attracted their first celebrity client, a pop singer whose anonymous stalker has a twisted concept of love. Before Skip realizes just how twisted, he involves first his psychotherapist wife and then their lawyer friend, Rob Franklin, in the case. Soon they are being hounded by paparazzi and someone is planting evidence to convince Skip that Kate and Rob are lovers. As they try to protect their relationship and family from this onslaught of unwanted attention, as well as a stalker who will stop at nothing to remove the obstacles in his path, Kate and Skip struggle with the reality that you can’t always keep those you love from harm. Writing and psychology have always vied for number one on Kassandra Lamb’s Greatest Passions list. In her youth, she had to make a decision between writing and paying the bills. Partial to electricity and food, she studied psychology. Now retired from a career as a psychotherapist and college professor, she spends most of her time in an alternate universe in which her protagonist, Kate Huntington, is always the kind, generous and insightful person that Kass wishes she was herself. When not at her computer, transported in mind and spirit into Kate’s world, Kass lives in Florida and Maryland, with her husband and her Alaskan Husky, Amelia. She also hangs out a lot on Twitter and Facebook, so feel free to track her down there.